Jovian, his pearl-diademed, draped and cuirassed bust right. Minted at the 2nd officina in Siscia (Sisak, Croatia) between 27 June 363 and 16 February 364 A.D.
Kent, J.P.C., "Roman Imperial Coinage", Volume 8 (RIC), Siscia, p381, nr. 426.
hinterlassenen Sammlung und Aufzeichnung des Herrn Paul Gerin" (Voetter-Gerin), Siscia, Jovianus, p310, nr 1. 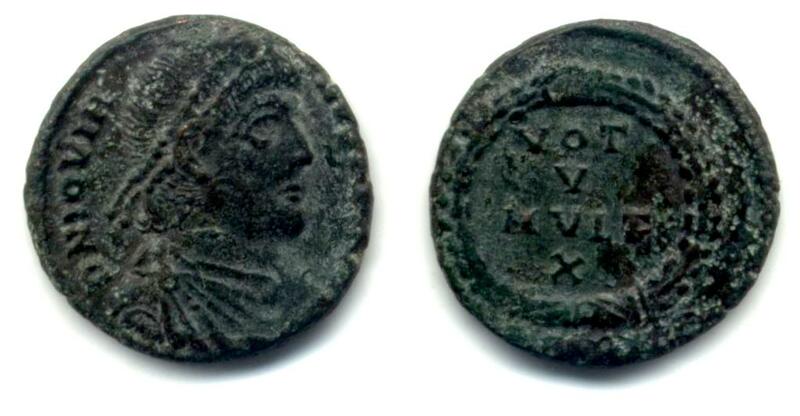 Failmezger, V., "Roman Bronze Coins From Paganism To Christianity 294-364 A.D.", nr 474JV. Cohen, H, "Descriptions Historique des Monnaies frappees sous l'Empire Romain" (C), Volume 8, p79, nr. 35. Carson, Hill, & Kent, "Late Roman Bronze Coinage", Part II, p71, nr 1267. Van Meter, D., "Handbook of Roman Imperial Coins", p305, nr 13. Suarez, R., "Encyclopedia of Roman Imperial Coins" (ERIC), p511, nr.33-35, variety M12 (B4, O3, R13, T9, M12).